I have no idea why I was anxious about my long run this morning, but I didn't get much sleep last night because of it. I think I was just worried about being so sore and trying to run 12 miles. My calves were still very tight and sore when I got out of bed, but I was determined not to skip my run. Eli spent the night at my parents' house last night, so I was able to take advantage of that and run outside. It was also very nice running weather this morning, considering the weather we've had lately. It was 67 degrees and overcast. I did my favorite trail through the Metropark, but had to add in a little extra to hit 12 miles. As soon as I started running, I thought, "Oh wow, this is going to be a long run!" because my calves were hurting from the Wii Active. I hoped they would loosen up after a couple of miles, and they did--thank goodness. I ran 5 miles, going to the far point of the Metropark, then turned around. As soon as I turned around, I was running directly into a strong wind. I had no idea how windy it was, because it was at my back the whole way out. As soon as I wasn't so close to the lake, the wind wasn't too bad anymore. Instead of following my route back to the car, I did a 2-mile detour to add some mileage. I ran a dirt trail that loops through the woods and right along the lake. I love to run that spot! This picture was from April. Now everything is full and green, so it's a lot thicker. But still, you get the idea. I refilled my water at about mile 8. That was actually the only time I stopped throughout the entire run. My knee held up perfectly, so I didn't have to do any walk breaks. 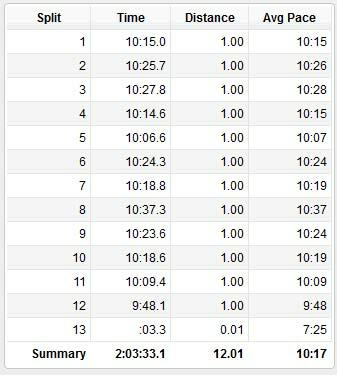 I kept a pretty even pace the whole time, which is my main goal on my long runs--to stay consistent. As I drove home, I remembered that I also was supposed to do the Wii Active 30-Day Challenge today. I really didn't want to! My legs were extremely sore from the last two workouts, and I had just run 12 miles. But like I said, I am determined to finish the challenge this time. So I didn't even eat breakfast before jumping into the Wii Active workout. Thankfully, there was a lot of focus on arms today. I did have to do the inline skating once, which was killer; and I had to do side-to-side jumps, but those went by fast. This time my heart rate monitor said I burned more calories than the game. The heart rate monitor showed a burn of 150 calories, compared to 145 on the game. My heart was probably working a little harder since I was already exhausted from the run. I quickly showered and all I could think of was breakfast. I am rarely in the mood for eggs, but I really wanted scrambled eggs with potatoes and cheese. So I peeled and shredded a potato, and cooked it with some diced green pepper, and then added 3 eggs and a wedge of chipotle Laughing Cow cheese. It was SO good, and just what I needed after all the exercise. I read my book until Jerry woke up, and then we (along with Eli) went to Cracker Barrel for lunch so I could get my beloved pecan pancakes. They were fantastic, as always, but the service was terrible and it kind of ruined my runner's high. I told Jerry maybe I'll think of a different treat to refuel my long runs with. The last two times we've gone there, the service was bad. I actually finished The Glass Castle today! Much sooner than I expected to, which means it held my interest enough to make me want to keep reading. It reminded me SO MUCH of the TV show on Showtime called "Shameless". (I absolutely love that show!) But anyway, the book was great and I'm glad I read it. Thanks to all of you who suggested it! Next I'm going to start on Racing Weight. Those pecan pancakes sound soooo good! Oh, please report the poor service to your Cracker Barrel! You'll be doing them and future diners there a favor. Trikkes are absolutely fantastic!!!!! I got to try one last October at a fitness festival. Completely hooked. I hope to get one someday! ooh I might have to add that to my reading list. I've seen a few episodes of the British Shameless and it is so funny! I think Cracker Barrel service across the board has really tanked in the last few years. I've tested it at 2 or 3 different stores and have experienced the same things. Slow or no drink refills, very stingy with the biscuits/cornbread, etc. Recently my aunt was at a CB in her neck of the woods and reported this type of poor service to the manager and he sided with the waitress even though he had watched everything that happened. They literally had to go to the kitchen door area and flag someone down to get a refill on a drink. Cost cutting measures? Who knows. All I know is I don't darken their doors anymore and I'm not missing anything. 2 workouts in one day, you're a ROCKSTAR!! Wow, I would not have been able to convince myself to do another workout after a 12 mile run!! I'm so glad to hear your knee held up. That egg/potato mixture looks SO yummy!! So proud of you for sticking with your challenge. Can you imagine just a few short years ago you could do this? Maybe you can learn to make a lighter version of the pancakes at home? I love Shameless! And it seems like service is getting poor most places these days, it's hard to find decent service! Good job on the killer workout! I've also noticed a fall-off in service at several CBs near me. It's a real shame since CB is such a nice treat...and one of the few places my whole family can agree on. It's gotten to the point that I don't go except when I'm meeting my mother-in-law...and then I expect the service to be awful. That Trikke you saw is an awesome workout and a full body engaging experience. The success stories of weight-loss and simply having something fun to do outside is amazing.